Created from my original painting, "Chicken Are Friends, Not Food" in loving memory of Malachi, my Best Friend and favorite dog. Each piece is uniquely designed and custom-printed. Color and placement of artwork may vary upon receipt. CUSTOM MADE WITH ORIGINAL ART. DELIVERED IN 6-8 WEEKS. 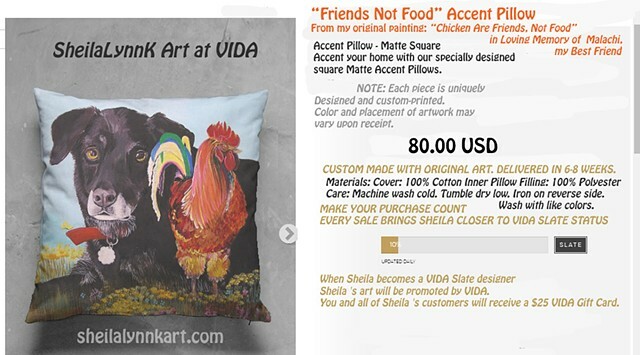 Sheila 's art will be promoted by VIDA. You and all of Sheila 's customers will receive a $25 VIDA Gift Card.